Cauda equina syndrome is an emergency condition characterised by persistent severe low back pain caused by compression of a bundle of spinal nerves (cauda equina) at the end of the spinal cord (lower back and hip region). If not treated promptly, it can lead to permanent paralysis of the legs, or bowel, bladder and sexual problems. 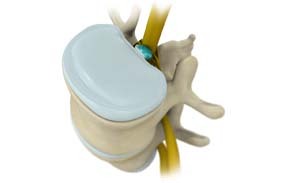 Compression of the cauda equina nerves may be caused by narrowing or compression from ruptured intervertebral disks in the lower back, spinal injury, fracture, infection, inflammation or presence of a tumour. It is usually seen in adults, but may also occur in children with spinal birth defects. Persistent severe low back pain may be accompanied by symptoms such as numbness in your inner thighs and buttocks, weakness or pain in the legs, loss of bowel and bladder control and sexual dysfunction. Care should be instituted within 48 hours of the onset of symptoms to prevent permanent damage. Surgery is required to remove structures (tumours or ruptured disks) compressing the cauda equina. Your doctor will prescribe steroids to reduce inflammation and antibiotics to treat infections.